Brother John Paul Jones, Revolutionary War father of the United States Navy, will be honored on Sunday by Maryland Freemasons. Several hundred Freemasons will honor famed naval leader John Paul Jones Sunday with a belated memorial service at the Naval Academy. "We were going through records and realized a ceremony had never taken place," said Tom Foster, director of communications for the Grand Lodge of Maryland. Any mason who dies is entitled to a Masonic funeral service, Foster said. "It's the final honor that we can bestow on our departed brother," he said. "Better late than never." 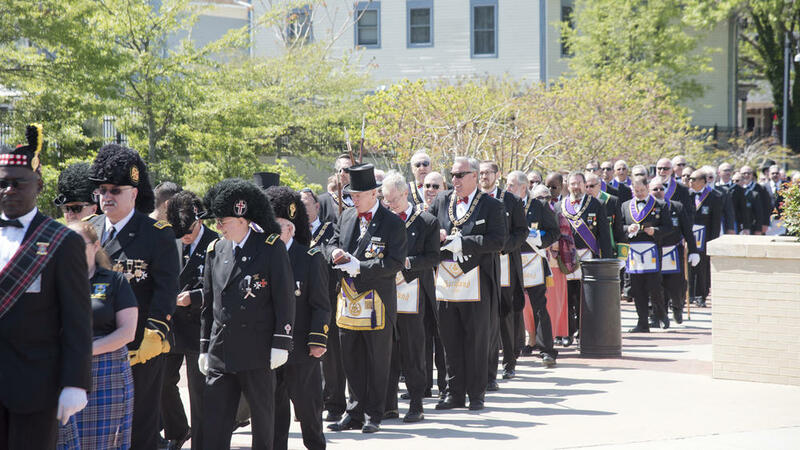 On Sunday, between 200 and 300 Freemasons from across the country — wearing tuxedos, aprons and "all the accouterments that come with that" — will gather at the Annapolis lodge before embarking on a procession to the academy's Dahlgren Hall, Foster said. "It'll be a spectacle," he said. The ceremony will feature remarks about Jones, his service and his masonry, as well as a color guard, a hymn and the playing of "Taps." Foster said the Masons will pass the boat show, but will do their best to stay on the sidewalks. "We just ask for a little patience as we proceed through the streets," he said. The reporter misinterpreted Brother Foster, which is not uncommon. It has long been known that Jones was a Mason, and a Short Talk Bulletin was published about him in April 1998. He had attended the local masonic lodge of Fredericksburg, Virginia (1774-1775) to which Washington had long been a member. On 16 August 1779, John Paul Jones made application to become affiliated with the Masonic Lodge of Les Neuf Soeurs (the Nine Sisters), at Paris. Two of the foremost men of the age were the members of this lodge, Dr. Benjamin Franklin and Voltaire. On 1 May 1780, the Lodge of the Nine Sisters (the Nine Muses) held a great festival and received Jones into its membership. At the same time it commissioned one of the world's greatest sculptors, Jean Antoine Houdon, to make a life size marble bust of Jones. "In 1788 he accepted an appointment from Empress Catherine of Russia as a Rear Admiral in the Russian Navy. He commanded a Naval force on the Black Sea fighting the Turks and was instrumental in winning several engagements for the Russian fleet. It is said that Empress Catherine, herself anti-Masonic, found that Jones was a proud member of the Craft and for this reason discharged him with full pay. He returned to France and shortly before his death retired from her service." The capital Gazette published a small gallery of photos from Sunday's event. See it HERE. As I suspected. It happens all the time, I'm afraid.